Creative writing for teens begins September 2013. Call 604-279-7060 for details or visit our website. Monday – Friday. For details call 604-279-7060 or visit our website. Single Mothers’ Support Group: We welcome you to join us to discuss single mothers’ needs and concerns and provide moral support and information on available community services. This program runs Thursdays from 7-8:30 pm at Richmond Caring Place. 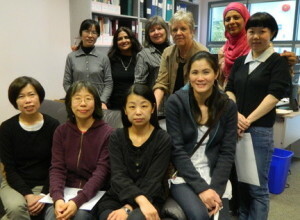 Ivy Women’s Cultural Group: Program now runs on Saturdays. Build your confidence in this social support group. Details on our website. nformation and Referral: RWRC offers peer support in a private setting. This program allows women in the community an opportunity to share their difficulties with other women and seek the resources within their community. Details on our website. Support Group: This group meets every other Monday from 9:30 to Noon. Discuss the needs of seniors and plan activities. Please call 604-279-7060. Computer Skills: Individualized computer classes in a classroom setting with computers. Internet training, keyboard skills, Word, Excel (Office 2010) are taught on Mondays each week in one hour sessions. Appointment required. Details on our website.